For nearly 20 years, Tyler Baze did whatever he could to lose the three or four pounds that would allow him to ride racehorses. 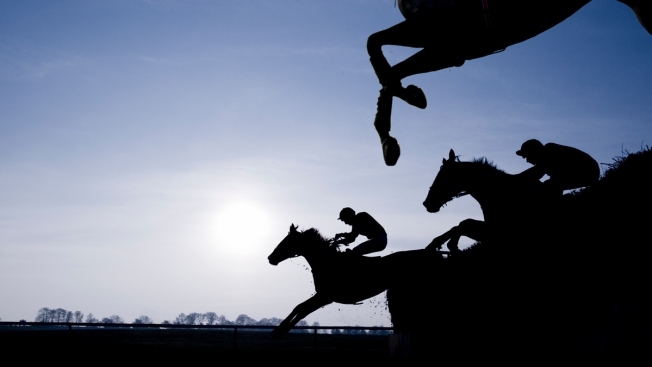 A file photo of silhouettes of race horses jumping a fence. Editor's note: jockeys pictured are not the ones quoted in the story. For more than 15 years, Tyler Baze did what he could to lose the three or so pounds that would allow him to ride racehorses: skip meals, run in sweat suits in the southern California heat and "flip," the jockeys' term for vomiting. The last year and a half has been different. Race tracks in California raised weight restrictions slightly so that the 35-year-old says he no longer has to go to such extremes. "It's let me be a lot healthier," he said. "Physically and mentally, way, way better....I think I ride better. I think clearly out there. It's just healthier for everybody." The low weights demanded of jockeys have long been a source of friction in the racing world, with the riders complaining that they are unrealistic and trainers countering that horses could be injured if they carried more weight. In her bestselling book "Seabiscuit," Laura Hillenbrand described jockeys of the early 1920s and 1930s taking the same severe measures: dinners of a leaf or two of lettuce, barely any water, vomiting, diuretics and laxatives, rubber suits, even ingesting the egg of a tape worm. An article last year in the Paulick Report, the website covering thoroughbred racing, noted that in 1929 jockeys could weigh as little as 95 pounds, and that included equipment, while its sampling of race tracks last January showed minimums of 114 and 115 pounds for journeymen, or experienced jockeys. The range their weight must fall within have risen over the years, but slowly, "progress in steps, not strides," it wrote. 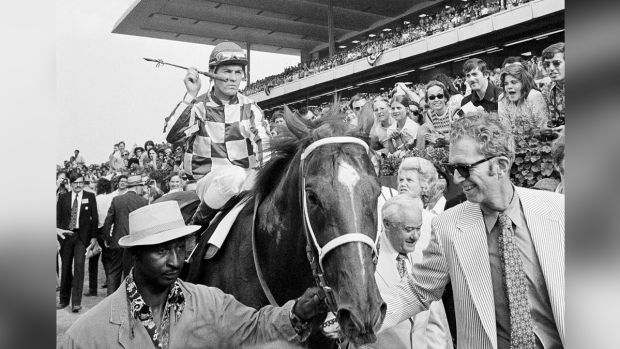 A decade ago, The Associated Press wrote that the racing world had finally begun to address the issue, with race tracks in California, Florida, Kentucky, New Jersey and New York raising minimum weights about 3 or 4 pounds or more to 115 or 116 pounds. 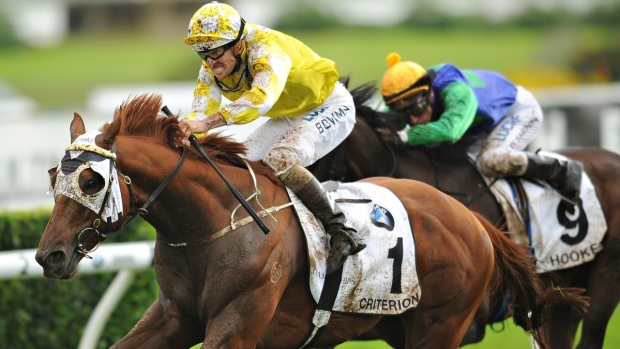 Nutrition programs were being introduced to encourage jockeys to eat properly. At the time, it wrote, tracks decided on their own weight ranges through a complicated system based on the type of race, a horse's age, gender and past performances. The Jockeys' Guild was lobbying for a standard minimum weight of 118 pounds -- for the rider, clothing and gear -- and body fat levels of no less than 5 percent. That continues to be true. 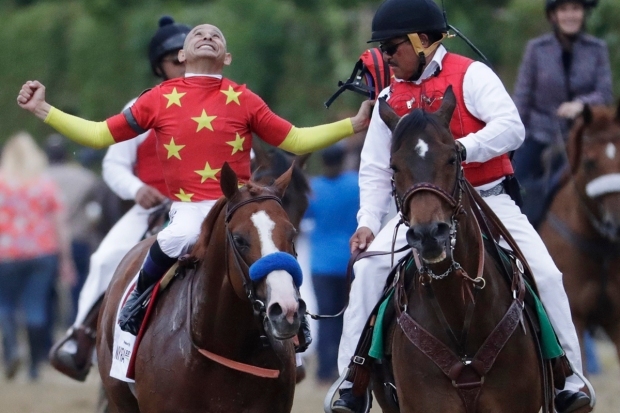 There is no one standard for weight in racing, only a recommendation that a jockey not carry less than 118 pounds, according to the Association of Racing Commissioners International. 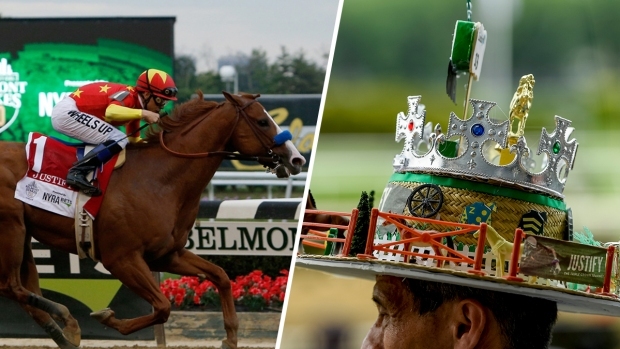 For Saturday's Belmont Stakes, colts and geldings carry a weight of 126 pounds, fillies, 121 pounds. 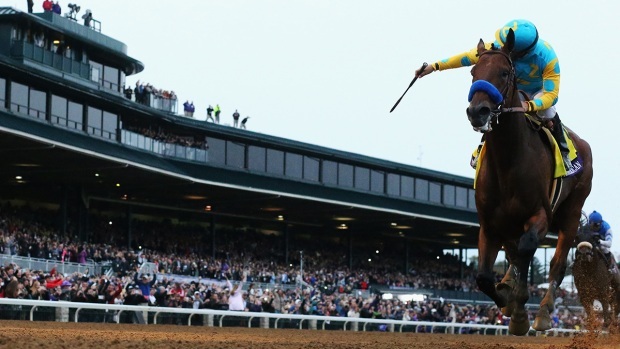 But now the minimum also has been adopted at race tracks such as Santa Anita Park in Arcadia, California, and Golden Gate Fields in Berkeley. The Jockeys' Guild regional manager for the West Coast, 62-year-old Darrell Haire, was a jockey himself and he knows firsthand the struggle to stay thin. He spent hours in saunas and took the diuretic Lasix, which made him urinate repeatedly. "The majority — and that's what it is, the majority — aren't that small any more, especially the American riders," said Haire, who has been arguing for higher weights for 17 years. "They're really abusing their bodies in order to do that kind of weight." With the extra allowance, the jockeys are not dehydrated and bulimic. They can ride with heavier saddles, which are safer, he said. Their minds are sharp. Jockeys are already amazingly fit and now they can be healthy too, he said. Haire said similar changes have been made at race tracks throughout the western part of the United States, including Oregon, Washington, Idaho and Arizona. "Now the rest of the country has to catch on," he said. Patrick Mackey, the racing secretary at Golden Gate Fields, admits that he was hesitant at first, afraid he would get opposition from owners and trainers. He got none and is pleased with the new minimum weight, which allows the jockeys to ride at their natural weight and strength and to ride the horses better. "You can see it not only in the way they look, it's in the way they ride, their mood," he said. "They're much happier, and it's great to see. And it's safer. If you have someone going out there that's just had cut four or five pounds and they're riding weak, that doesn't only put them at risk, their horse, it puts everyone else at risk. And that's something we don't want." He said the race track seemed to have set a good weight range now, from 118 to 127 pounds, though he could see it rising a pound or two in the future. But he cautioned, "You'd be skating a fine line if you wanted to get it higher." New York jockeys, who have been riding without a contract since January, are trying to bring about a similar change. They delayed the start of racing at Belmont Park in Elmont one day last month to draw attention to what has become a rancorous dispute. In an interview with the Thoroughbred Daily News, the president of the New York Thoroughbred Horsemen's Association, Joe Appelbaum, cited weights as low as 109 pounds at Laurel Park in Laurel, Maryland, and 110 pounds at Monmouth Park Racetrack in Oceanport, New Jersey. "Health and safety is very important," he said. "But we also want to stay competitive with what are the scales of weights in other states. It's a complicated issue." Jockeys and others point out that minimum weights have been higher for years in other countries. And exercise riders weighing in the 140 to 180 pound range take horses out for morning workouts. A 1995 study by the Chicago Rehabilitation Institute found that 69 percent of riders said they skipped meals, 34 percent used diuretics, 67 percent sweated in saunas, 30 percent induced vomiting and 14 percent took laxatives. "I don't know if it's gotten any better since 1995 because there's been no follow up to this survey," said Paul von Hippel, an associate professor of public policy, sociology, statistics and data science at the University of Texas at Austin. "Except for the weight increases...I don't really see why it would become less common because it's just very hard for men to get down to these sizes." In the meantime, he noted that women are much better sized to ride in thoroughbred races. There are about 10 times as many women at jockey weight than men, he said, though women will be missing from the Belmont Stakes. Lauren Smolar, director of programs at the National Eating Disorders Association, said that more and more men are seeking help for eating disorders. "However, there is still a large stigma for men related to eating disorders," she said in an email. "Symptoms in men are still less likely to be recognized as eating disorders and seeking help for mental health concerns is still something that a lot of men find very challenging to do." Treatment for jockeys would take into account the pressures of their industry, she said. Randy Romero, a retired jockey who was known as the Evil Knievel of the racing world and who was burned over 60 percent of his body in a sauna, has talked about inducing vomiting from an early age. He had 37 surgeries, got hepatitis C from tainted blood during one procedure, damaging his liver, and he now needs weekly dialysis for his one remaining kidney. Romero, 60, believes he would have been an even stronger rider than he was if he hadn't had to fight to keep his weight down. He would raise the minimum weight to 120 pounds. "Why just go for a little bit?" he asked. "That won't bother a horse." Baze says he stopped "flipping," or vomiting, a couple of years ago when his young daughter noticed and told his wife that he was sick. Now he can maintain a steady weight of 115 or 116 pounds, compared to having to struggle to get down to 111 or 112 pounds. "I think it's perfect," he said.